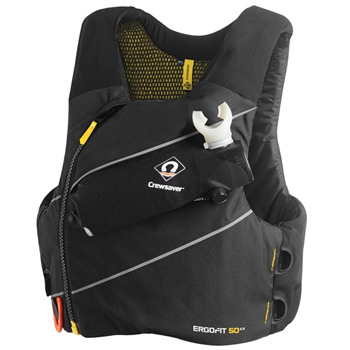 The Crewsaver ErgoFit 50N Extreme buoyancy aid, a revolution in personal safety equipment, provides the most advanced safety specification a buoyancy aid has ever offered to date. Whilst also ensuring a low profile, maximum comfort design there are no compromises for those operating in the most demanding conditions. Through the partnership with Artemis Racing, Crewsaver was able to develop this innovative buoyancy aid, now this same technology can be made available to all sailors, giving everybody the opportunity to benefit from the same advanced safety and performance technology as an America’s Cup sailor! Combining advanced safety features such as Spare Air attachments, high impact body armour* and line cutter stowage with a low profile, snag free design means that you can expect nothing but the best in safety and performance technology. * Also available without high impact body armour.